Forgot to clean my mirror today. Sorry! How far along? 37 weeks - she's officially full term! Feeling: Mixed. Some days are good and some days are really, really bad. Overall, my spirits are improved just knowing that she will be here really soon! When I wake up still having morning sickness at this point, though...and when I can't sleep because my body aches so much....well, then it's a little more difficult. Maternity clothes? I pretty much hate all of my maternity clothes at this point. I don't want to see them anymore. I miss real jeans. Movement? She's still really active. I don't think she has realized that she is out of room, while I am definitely aware of this! What I miss? Just feeling normal. Best moment this week: Reaching full term and knowing that I'm in the clear to deliver at the birth center as planned! Also we put up the Christmas tree and it makes me happy! 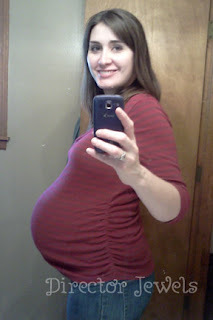 Next Appointment: November 15 at 37 weeks, 6 days.